INDICATIONS: For blood pressure control in acute hypotensive states. ADULT: Add 4 mg to 250 ml of Normal Saline. Infuse starting at 30 drops per minute ( max 44 drops) with 60 drop tubing and titrate to effect. Increase by 5 drops every 5 minutes. PEDI: ♦ Contact MCP for dosing and administration guidance. THERAPEUTIC ACTION: Peripheral vasoconstrictor. Positive inotrope (increases cardiac contractility) and chronotrope (increases heart rate). CONTRAINDICATIONS: Should not be given to patients who are hypotensive from acute hemorrhage. PRECAUTIONS AND SIDE EFFECTS: THIS DRUG MUST BE DILUTED BEFORE ADMINISTRATION. Avoid hypertension. Administer in free-flowing IV and watch for infiltration. 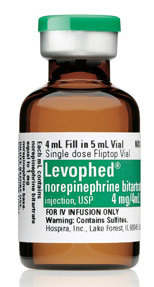 If extravasation occurs, stop the infusion immediately as necrosis may occur due to vasoconstrictive action of the drug. Leave the catheter in place so that a reversal agent can be given through the infiltrated catheter. The infusion must be stopped immediately if it free flows and call MCP. Do not use the solution if its color is pinkish or darker than slightly yellow or if it contains particles.